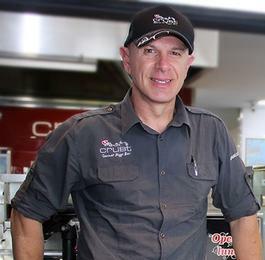 Interview with Jim Albanakis, Crust Pizza: "We’re appreciated within the community." "In our store, we have an array of ‘thank you’ awards displayed on top of the make bench and I’ve even had to put up new shelves to fit more in, which is evidence to my team & I that we’re appreciated within the community. We're extremely family orientated, my daughter has worked in the store for the last five years and my son has also helped out a lot." How long have you owned your store? We have recently celebrated our 8th birthday! I was working for a leading motor group, NRMA, managing a team for the road side assistance program, and was responsible for their performance. Why did you decide to open a Crust? I was given the heads up about the brand by my brother who went to a friend’s store opening. I then also found out another friend was opening a Crust store, so attended his opening night, and that inspired me to enquire about starting my own. The timing was right for me as I was offered redundancy at NRMA, so I thought it was a sign and decided to take it and open the store. Why should your local community support you? Crust customers get consistency and unique flavour combinations - we have seen a lot of people trying to copy our style of toppings. We are leaders in the market and want our customers to experience the best pizza that money can buy them. Also, in our store, we have an array of ‘thank you’ awards displayed on top of the make bench and I’ve even had to put up new shelves to fit more in, which is evidence to my team & I that we’re appreciated within the community. We support our local soccer team, Canteen, Carols by Candlelight, and local trivia nights. I used to be a drag car racer and would like to return to the track eventually. Drag car racing and mountain biking. How is your family involved with your store? My daughter has worked in the store for the last five years and my son has also helped out a lot.